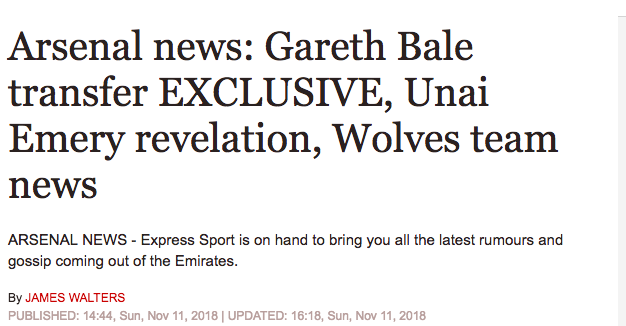 Hartson exclusively told Express Sport: “No disrespect to Arsenal, if say for arguments sake, a Gareth Bale becomes available [they won’t go in]. I know he’s ex-Spurs and it may not happen. May. Might not. What a scoop! Arsenal are a more solid under Unai Emery compared to when Arsene Wenger was in charge, Matthew Upson claims. And..? And nothing. That’s it. When ex-Gooner Upson speaks to the BBC it’s a “revelation”. The man’s a prophet. finally, how about that “Wolves team news”? It’s that Danny Welbeck, the bloke with the broken ankle, won’t be playing. More on him here.